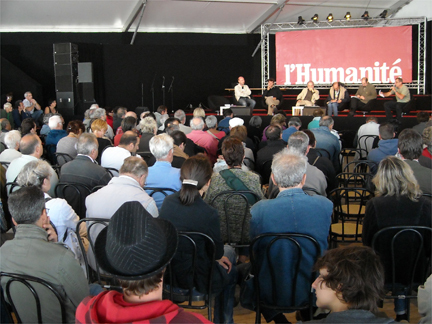 Communist, socialist and left-wing organisations gathered in the working class suburb of Le Bourget this weekend for La fête de l’Humanité. Although political debate dominated the agenda – a programme of music, art and theatre pleased the crowds at one of France’s biggest cultural festivals. “Really enjoyed myself, had a bit of a dance, had a bit of a drink, met with some friends,” said James, one of the festival goers. Colourful banners, vibrant flags and exciting music entertained thousands of people on Friday, Saturday and Sunday, with bands such as The Kooks and Deep Purple making a real impact. Away from the main music arenas, smaller tents hosted a variety of more intimate musical performances with reggae, folk, rap and indie all being represented. As you’d expect with a communist event, the festival was excellent value for money – tickets were just 18 euros, and a glass of wine at only one euro, kept everyone happy! Certainly cheaper than many of the other big-name festivals. The food was also something to behold and included traditional French fare such as cheese and meats, supplemented by an international flavour, with delights such as Argentine beef cooked on open charcoal fires. The political element to the festival ensured that fierce debates and arguments engaged intellectual lefties. Some of the debates included Palestine, intellectual property rights, capitalism, the economic crisis and trade unionism. There was also a bit of controversy as Frédéric Mitterrand, the French culture minister was booed and hissed as he arrived at the festival. “Mitterand out,” several people shouted. Minister of Budget, Eric Woerth received the same sort of treatment when he appeared in a public debate at the event on Sunday. He didn’t stay at the festival for long, and after a brief tour he made a quick exit. Other activists had a specific agenda for raising awareness and attracting visitors to their stalls. “The main issue for us at this fête de l’Humanité has in fact been the Lisbon treaty,” Noel Murphy from the Communist Party of Ireland told RFI. “We will be advocating a no vote,” he added. Murphy was keen to make contact with other European communist parties ahead of Ireland’s EU referendum in October. The weather remained good throughout the weekend, while the mix of politics and entertainment was interesting and engaging. “Spent a lovely evening at La fête de l’Humanité – its really nice, lovely atmosphere and happy to be here,” said Camille, after a day at the festival.